“We are always by your side, I think of Greek people every day,” said Kirill I of Moscow, who is paying an official visit to Greece. His visit is of significant religious and political importance. It is the first time after 21 years that the Primate of the Russian Orthodox Church has made an official visit to Greece. 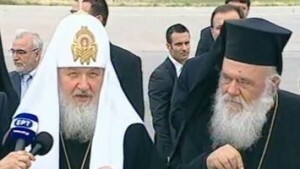 The Patriarch of Moscow and all Rus’, Kirill, arrived late in the afternoon of June 1 in Athens. Archbishop Ieronymos of Athens and all Greece accompanied by a large delegation of the Holy Synod and representatives of the Greek government, welcomed the Patriarch of Moscow at the Athens International Airport, Eleftherios Venizelos. On June 2 the Russian Patriarch and the Archbishop of Athens performed a common liturgy at the Church of St. Panteleimon in Acharnon Street. On June 3 Kirill will hold a meeting with the President of the Hellenic Republic, Karolos Papoulias and the Prime Minister of Greece, Antonis Samaras, and then he will depart to Mount Athos. Addressing the Patriarch of Moscow, Ieronymos expressed his deepest feelings of friendship and honor of the Greek Church in his face, mentioning at the same time that that Greeks and Russians are connected with common historic memories and struggles. Kirill talked about the role and the work of the Orthodox Church of Greece.